If the lightning doesn’t get them! The oldfolks would say, there’ll be lots of bakeapples if the lightning don’t get em! July, whether there’s any truth to it or not, or just superstition or coincidence, is an important month in determining the yield of some berries. Obviously a late frost is likely to kill the young forming berries, but we also used to say a lightning storm would kill the bakeapples (a topic for another post) before they could ripen. Whether there’s any scientific basis for this, or why it seems to be true I don’t know. One thing that did seem to be true though was that the yield of dewberries, also known as plumboys, seemed to be an indicator of how many bakeapples you’d get. That was kind of irrelevant to the kid me, and possibly still would be to the adult me if I were anywhere to get some of these! These wonderful little berries used to grow around our fence, and on the side of the old school garden path. While we never picked them to make a jam or jelly, I’ve spent many an hour hunting them out and staining my hands with their delicious red juice. 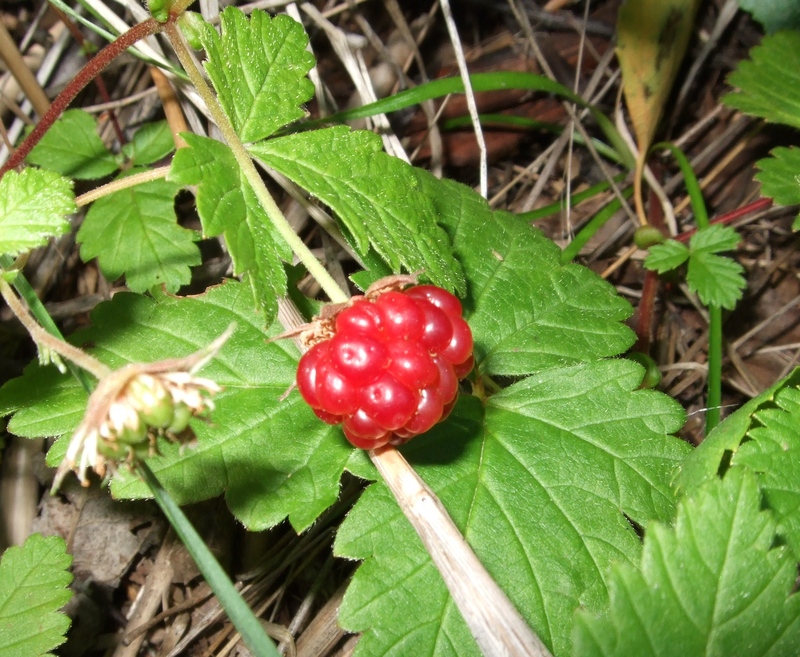 Looking similar to a raspberry, with a little seed in each nodule, they were more translucent in coloring, and would darken to a deep wine color with a ton of juice for their size. They too seemed to have some sort of reverse affinity with lightning though. If there happened to be a local lightning storm when they were ripening, the yield always seemed lower. Again for whatever reason, even if it was just the power of suggestion in out minds, I can’t say. In any event, I hope the lightning doesn’t get them, and someone mails me up a few hundred thousand! Lovely post. I first found out about these when working in Alberta. A co-worker told me they were toxic. Turns out he just wanted more for himself!